Contact Josh Hinds – Follow/Add Me! e-mail: jhinds [at] getmotivation.com (replace the [at] w/ @). 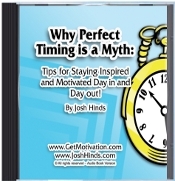 Josh Hinds is available for keynotes, breakouts and personal development trainings on a limited basis. If you’re intrested in having him present to your audience visit JoshHinds.com for more information. *Learn more about hiring me to speak to your group or organization.